Every year I go on a squash overload at the beginning of fall up until they start to disappear from the shelves! Squash is easily one of my favorite vegetables and there are so many kinds to love! Butternut squash is definitely one of my top favorites because it’s everywhere and so simple to make! This recipe combines some of my favorite fall flavors and makes and excellent side dish for a comforting fall meal! Chop your squash into small cubes and bake for 45 minutes until done. 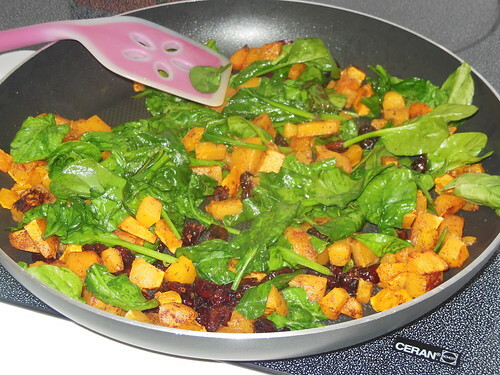 In a skillet over medium high heat, warm your coconut oil and add in your cooked squash. Sprinkle the cinnamon over the squash and stir. Add in your spinach and cover until wilted. Continue to mix adding in your cranberries. What’s your favorite fall squash??? 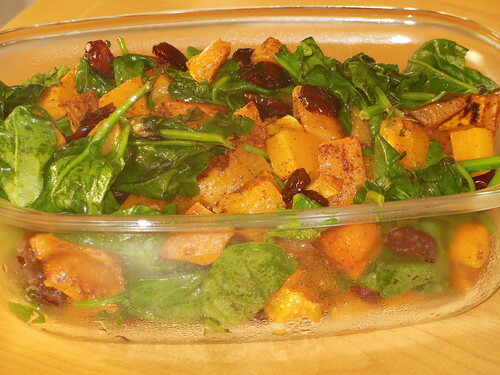 This entry was posted in Recipes and tagged butternut squash, gluten free, health, nutrition, paleo, recipe on November 25, 2014 by danielle. I love pairing squash with cinnamon! A few weeks ago I seriously had the best cinnamon roasted butternut squash from Whole Foods… I don’t know how they did it, but it was some of the best squash I’ve ever had! I can never find kaboocha anywhere! I do love buttercup squash too! I think it’s pretty similar to kaboocha! I LOVE Whole Foods’ cinnamon roasted butternut squash!! SO good! Never tried that but I’m going to have to look for it! Butternut squash is my favorite too! I have all of these ingredients and some spinach that needs to be used up, I might just be making this today. Oh perfect! I hope you like it! I LOVE winter squash. It’s hard to pick one favorite, but the one that comes out ahead if I have to choose is kabocha squash. It’s excellent! Everyone loves it! Wish I could find it more often! I just bought two butternut squash on sale yesterday at the store. We were debating on what to do with them! This looks yummy. I love acorn squash roasted topped with a scoop of sunflower seed butter and cinnamon. It’s almost like dessert! That sounds awesome! I’ve never actually tried acorn squash! I think I might have to try it! Butternut Squash is my favourite! And I love this recipe. I use to do a smoothie out of exactly these ingredients! Thanks Lucie! I bet a smoothie with all of this would be great! My favorite fall squash is kabocha and delicata!! Your recipe looks delicious!! I wish I could find unsweetened cranberries around here- only WF carries them that I know of! Thanks Wendy! Unfortunately that’s the only place near me that carries unsweetened cranberries too! I always make sure I have some on hand! Ohh I have all the ingredients for this. I love cranberries cooked into things better than just dried. Perfect! Glad you like it! I’ve never had homemade butternut squash soup before but I bet it’s fabulous! I would have never thought of using cinnamon on this. I need to get out of my savory vs sweet spice mentality. This sounds awesome! I love sweet with everything lol! It’s a bit of a problem ! I absolutely adore squash, and it makes me kind of sad that my stomach doesn’t seem to approve of it in the kind of mass quantities that I’d like to eat 😆 Butternut is fabulous (especially with cinnamon) but I think I’d have to go with kabocha as my all time favorite, simply because I love the fact that it’s a little bit drier. I love it so much too! It’s definitely my vegetable of choice! I love butternut squash! I need to make this for the holidays! Where did you find your dried cranberries? I always get the apple juice sweetened ones at Whole Foods! It’s the only kind I can find without added sugar! Great recipe! I’m looking for some ideas for when I prepare the giant butternut squash I got at the farmers market last weekend! Thanks Caitlin! Glad you like it! Oh. My. God. That looks AMAZING. This year is the first year I’ve been doing the squash thing because I had convinced myself I didn’t like it. Turns out I LOVE IT… I will have to try this asap! Thank you for sharing it! Can’t believe you never thought you like it! Hope you enjoy the recipe! yes, mine is delicata. I microwave it and then fill it with eggs! oh ya. I already in overload, EEK! Sounds awesome!!! I’ll have to try that! This is my first year getting into squash!!! I always hated it when my mom made it. Thought it was so gross. I still like to really spice it up to mask the taste a little! That’s so funny! I like so many things now that I used to detest when I was younger! 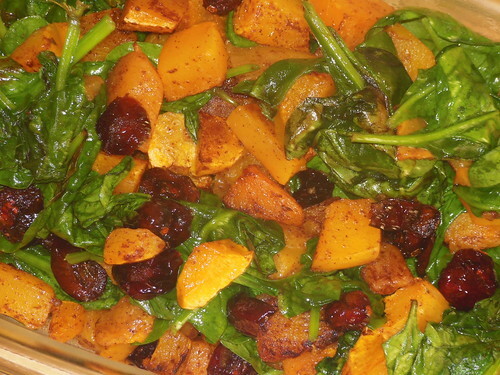 Mmm…I love all the colors and flavors in this recipe–it’s really quintessential fall! I may make this for Thanksgiving! Kabocha squash is definitely my favorite, but I buy butternut more often because it’s easier to find and a bit more versatile. I usually roast it with coconut oil, salt and pepper and then “accessorize” according to what I’m craving. Sometimes I’ll sprinkle feta or Parmesan on top, sometimes I add cinnamon; sometimes a drizzle of tahini. I also love pureeing the roasted squash into soup. It makes for a soup with much more flavor than when you simply boil the squash! All those ideas sound so yummy! I really need to try making a roasted squash soup! Never had it but sounds so good! Ooooh, Danielle this looks SO. GOOD. Mmmm! LOVE cinnamon and spinach together! Actually, my lunch today was sauteed spinach and red onion with cinnamon stuffed inside a kuri squash with cottage cheese, sunflower seed butter, and jam…SO GOOD!! My favorite winter squash? Hands down: KABOCHA! !